I wrote the first draft of my debut novel, Greta and Boris: A Daring Rescue, http://www.foyles.co.uk/witem/childrens/greta-and-boris-a-daring-rescue,sian-norris-9781780996233 during the university summer holidays, for a competition. It didn’t win. Disappointed, I put my manuscript away and went back to London to finish my degree. But I never quite forgot about Greta’s adventures. When I self-published my feminist anthology, The Light Bulb Moment http://www.lulu.com/gb/en/shop/sian-norris/the-light-bulb-moment-the-stories-of-why-we-are-feminists/paperback/product-18726169.htmlin 2011, I revisited Greta and Boris to do a self-publishing trial run. A journalist friend of mine read it, loved it, and encouraged me to get it published. 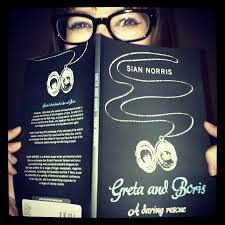 http://bidisha-online.blogspot.co.uk/2012/01/greta-and-boris-by-sian-norris.html So finally in 2013, eight years after I put that first draft together, Greta and Boris http://www.ourstreet-books.com/books/greta-boris hit the shelves. I don’t think I intended to write a feminist children’s story when I was 20. But when I re-read the book aged 27, I realised I had – subconsciously perhaps – created a tale where a Prince (Boris, Prince of Cats) is held prisoner (by the dastardly Rat King) and the only person who can rescue him is Greta (his owner, a 12 year old girl, helped by a female warrior cat called Kyrie). I had chosen to write a novel that turned the entire fairy tale genre on its head. As a child, I had always loved books where girls got to “do” things. I loved The Little White Horse, where it is up to Maria to save Moonacre valley. I devoured Quest for a Maid, where Meg sails off to adventure and her sister Inge is the most powerful character in the whole novel. Throughout my reading life, I have always turned to books with strong, independent women and girl characters who shape their own lives and destinies – from Bronte’s Jane Eyre to Colette’s Claudine and Marge Piercy’s Miriam. At university, studying for my English Literature degree, I turned away from the syllabus where men’s stories ruled the roost, and instead discovered the stories of women – reading Jean Rhys, Virginia Woolf, Katherine Mansfield and Djuna Barnes. So perhaps it’s not surprising that, consciously or not, I wrote a book where a girl goes out into the world and makes her own adventure. Greta is undoubtedly a girl who gets to ‘do’. Her adventures with Kyrie take her up the staircase of autumn leaves, over the Milky Sea, across the land of the warring mice and face to face with the millpond of truth – all before she has to challenge the Rat King himself to win Boris’s freedom. But all this doing doesn’t come easy to her. One of the dangers Greta braves is her own lack of self-belief. For Greta to succeed, she needs to learn that she *can do*, after years of hearing that she can’t. To me, Greta and Boris is a book that can be loved by all children. But when I told people about the story, I was often met with questions about having written a book ‘for girls’, and how that might impact on its saleability. The argument goes that the mere fact a book is about girls means it is only for girls. The belief is that both boys and girls read books about boys – but boys will turn away from books featuring girls. As a feminist, a passionate campaigner for stories, and a believer that all children should have access to great books, I believe we must challenge the stereotype that divides books into gendered categories, and which could potentially restrict boys from discovering some wonderful novels. There has recently been a lot of valuable and needed talk about how we can encourage boys to read, and how we can try and make reading ‘cool’ for boys. Boys finding reading uncool is a hugely important issue. It has an impact on their lives, education and creativity. It’s vital that we as writers, readers and activists encourage boys to get their noses into books. However, part of the efforts made to change boys’ attitudes to reading has involved this stubborn and pernicious argument that boys will only read books about boys. It’s these kind of arguments that led to an extreme and stated male bias on the World Book Day list this year. While I fully support the efforts to encourage boys and young men to get reading, I believe it should not and cannot be done by excluding girls’ stories from boys’ bookshelves. We cannot encourage boys to read by deciding on their behalf that they only want to read certain books, and those books aren’t by or about women and girls. A troubling aspect about this strategy is that it gives the impression to young men and boys that girls and girls’ lives are somehow lesser or ‘uncool’. It feeds into stereotypes repeated by such esteemed authors like VS Naipul that women only write about the domestic (which is female), where men write about the universal (which is, of course, male). It sends a message that stories about girls are inherently less interesting, because girls are less interesting. This is clearly not true, and it is definitely not okay. A further problem is that by saying boys don’t want to read books about girls or by women, we are restricting boys’ reading choices at a time when we are trying to widen their access to books. It’s completely illogical. Everyone should read Wuthering Heights. Everyone should read The Hunger Games. Everyone should read Harry Potter and The Worst Witch and Carbonel and The Colour Purple and I Know Why the Caged Bird Sings and And Their Eyes Were Watching God and To Kill a Mockingbird – just as everyone should read the great books by great male authors. All good, interesting, exciting, funny, moving, emotional, clever, fantastical, brilliant stories have a place on all children’s (and grown-ups!) bookshelves – regardless of the gender of the protagonist or the author. The recent success of the Disney movie Frozen proves more than ever how this gender divide of boy vs girl stories is not only misguided, it’s wrong. My friend’s daughter loves Frozen as much as my nephew. The success of a film which focuses on the adventures and stories of two sisters came as a surprise to many. People asked how a film that focuses on girls could do so well, could become such a cultural phenomenon. But the answer was simple. It was a good story that emotionally resonated with children (and grown-ups!). Frozen showed that stories about girls can be interesting and funny and exciting to boys to everyone. When I wrote the first draft of Greta and Boris, having a girl protagonist was a natural decision for me, based on the books I read and loved as a child, and my own longing for adventure. I hope I have written a book that can and will be read and cherished by boys and girls of all ages. More than that, I hope my book contributes to a future where we will stop believing that boys will only love books by boys and about boys. All good stories deserve to be told and enjoyed by all children, regardless of whether they’re a boy or a girl. Sian Norris is a writer and feminist activist. She runs the successful feminist blog www.sianandcrookedrib.blogspot.com and her writing has appeared in the Guardian, The New Statesman, The Independent, The F Word and Rockfeedback. Her first novel, Greta and Boris: A Daring Rescue was published by Our Street Books. This entry was posted in Uncategorized on 20/07/2014 by pgcwwn.